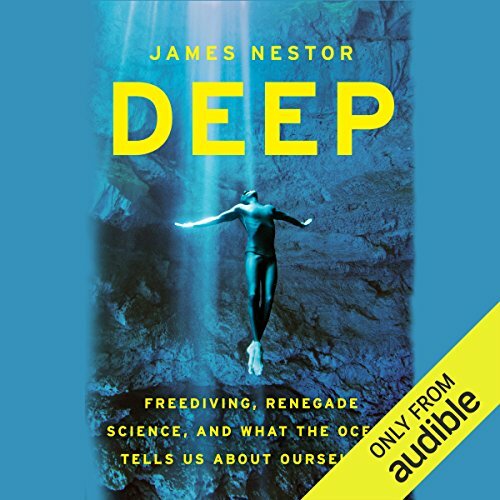 ©2014 James Nestor (P)2016 Audible, Inc.
It’s a great story of the authors journey and discovery of not only the sport of free diving but also the current research and science of going deep. I loved the storyline, the transformational and continually more and more immersive (deeper and deeper) interest he took. Another great author from Outside Mag. Narration is good but I’m not sure why he chose to change the voice when speaking the other’s parts - for half the book I thought he was making fun of the people (this is obviously very minor and kind of funny). Great overall. I have always been a fan of reading anything related to treasure hunting and shipwreck diving so this came up as a recommendation based on my listening history. I did not expect much but I got more than I bargained for! The amount of danger that these divers experience with these free dives is unbelievable. I could not believe how many risks they take and come out alive. I don't think our bodies were meant to dive hundreds of feet under water but these divers do it over and over again with blackouts and near death experiences. If you are even remotely interested in anything water or nautical related, you will enjoy this book. Where does Deep rank among all the audiobooks you’ve listened to so far? I think this is one of the best books I've ever listened to! What was one of the most memorable moments of Deep? I realized that in addition to learning about freediving, I was also learning so much more about the ocean, its inhabitants and its history. What about James Nestor’s performance did you like? The narration was really good. It was easy to follow and even though I listen to the book in small segments that go along with my commute, I never felt like I lost my place. I was super sad when the book was coming to a close. The content of the book really made me think and it was so well written and read that I realized it was a rare find and I'm so glad to have been able to experience it! Have you ever looked at a body of water and marveled at it, how deep is it, how cold or what lives in it. If you have then Deep allows you to have a look into the word of free diving and the zen philosophy behind it. It describes free diving in a way that makes you want more. I'm not exactly sure what I was looking for when I happened upon this book. I'd been scuba diving for over 5 years. I had never considered freediving before. But I guess one thing unites underwater folks, we love being in the water and the creatures that occupy it. If either criteria applies to you, you'll like this book. I really like the format and how the author used depth. Great book- so much more than just about freediving. Loved learning about the different "renegade science" projects worldwide and ocean research facilitated by freediving. Deeper was much more profound than I thought it would be. As a freediver myself, I thought it would simply be about the world of freediving, but it is so much more than that. It’s a philosophical journey into our minds and our place on Earth. What a wonderfully thought provoking and fascinating story. I would recommend this book to anyone who wants to understand and learn more about human abilities to dive deep. I am a free diver and found this book helpful, motivating, a breeze to listen, easy to comprehend. This is a fantastic book. Fascinating stories and solid info on freediving and oceanic state of affairs. This story is wildly entertaining and is as important as anything you will encounter in modern non-fiction. I found myself googling its wild cast of characters to learn more about their endeavors and the answers they seek. Enterspecies communication, radical freediving to unheard of depths and the search for the amphibious proto humans we evolved from to the origins of life itself; there is much here to love. Like the sea itself this book calls to us to return to our earliest existence. Bravo.